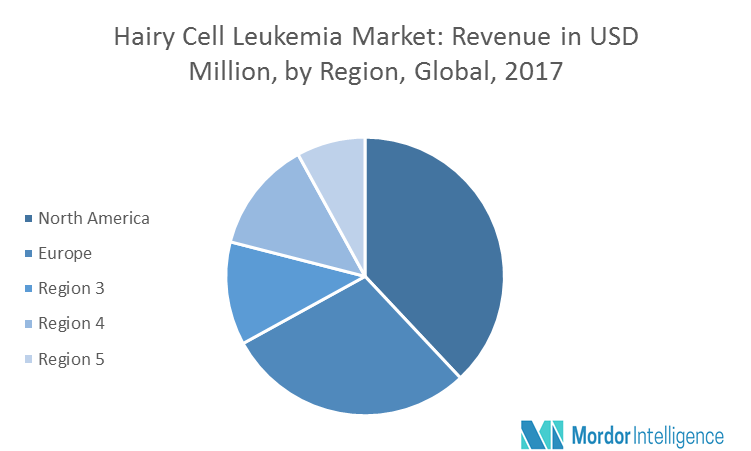 The hairy cell leukaemia market is expected to register a CAGR of 5% during the forecast period 2018 to 2023. Hairy cell leukaemia is a type of blood cancer associated with accumulation of abnormal lymphocytes. Hairy cell leukaemia is very infrequent type of leukaemia, which is rarely known to the people all over the world. There is no proper data available on incidence or prevalence of hairy cell leukaemia, which implies an insufficient research documents. This disease can be treated if diagnosed in early stages, but due to lack of awareness of the symptoms of hairy cell leukaemia among people limits the diagnosis of the disease, which is a major factor restricting the growth of the market. The other factors, such as limited health services in rural hospitals, is the major restraint for the global hairy cell leukaemia market. Major Players include AbbVie, Astellas Pharma, AstraZeneca, Biogenomics Limited, F. Hoffmann-La Roche AG, Incyte Corp., Juno Therapeutics, MedImmune, and Novartis among others.